Standing at 5’3” at the shoulder and weighing up to 300kg, the Roan Antelope is the second largest antelope, after the Eland. 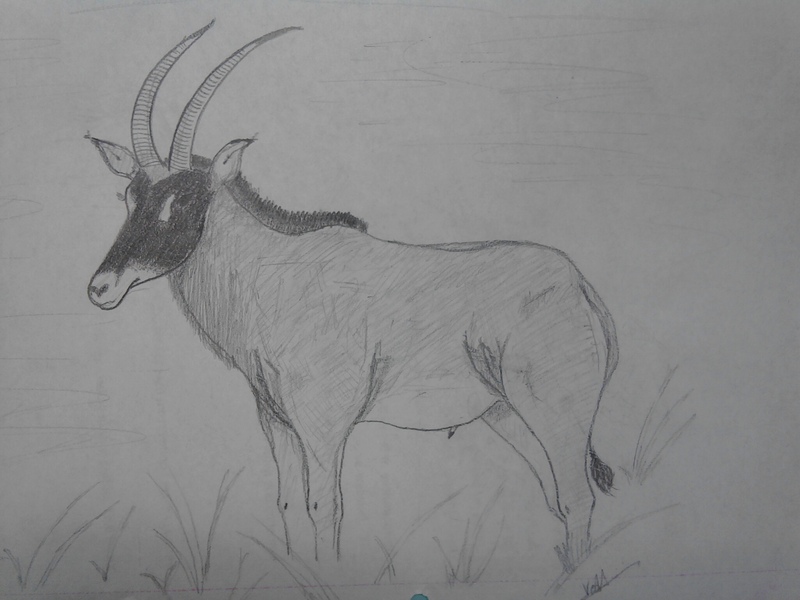 The Roan Antelope belongs to the subfamily Hippotraginae, which includes the Gemsbok (https://jonvoo.wordpress.com/2012/04/03/antelopes-a-b-c-gemsbok-oryx-gazella-3-2/) and the Arabian Oryx. Its closest cousins are the Sable antelope and the now extinct Blue Antelope, where all three belong to the genus Hippotragus. Horns are present in both sexes, with those on bulls more heavily ridged and longer than those on the cows. The roan is a somewhat unwary antelope as it tends to run a short distance and then stop to look back when threatened. However, if pursued, it can reach speeds of up to 57km per hour. If cornered, these antelopes will back into a corner whilst charging and brandishing their sharp horns with surprising accuracy and skill. Its natural enemies include lions and hyenas, while calves fall prey to wild dogs, cheetahs and leopards. It is a grazer and will occasionally supplement its diet by chewing bones. The roan prefers lightly wooded grasslands and can be found throughout central Africa. Fighting for dominance is frequent for both sexes, with the dominant taking charge of the direction of the herd’s movements and best feeding areas. A typical herd is made up of a dominant male, 6 to 15 cows, and their young. Young males are tolerated as long as they do not show interest in the females. When they reach 2 years, these males are usually chased away from their natal herd and will join a bachelor herd till they are ready to challenge for a herd of their own. In Angola, because of the civil war, hunting and human encroachment, the Giant Sable (a subspecies of the Sable and a cousin of the Roan) has been reduced to a population of approximately 300 individuals. Due to the lack of prime Giant Sable bulls, there have been instances of cross-breeding between Roan bulls and female Giant Sables. This could potentially lead to serious problems since the Giant Sable is classified as critically endangered by the IUCN. The roan itself is classified as Least Concern by the IUCN.